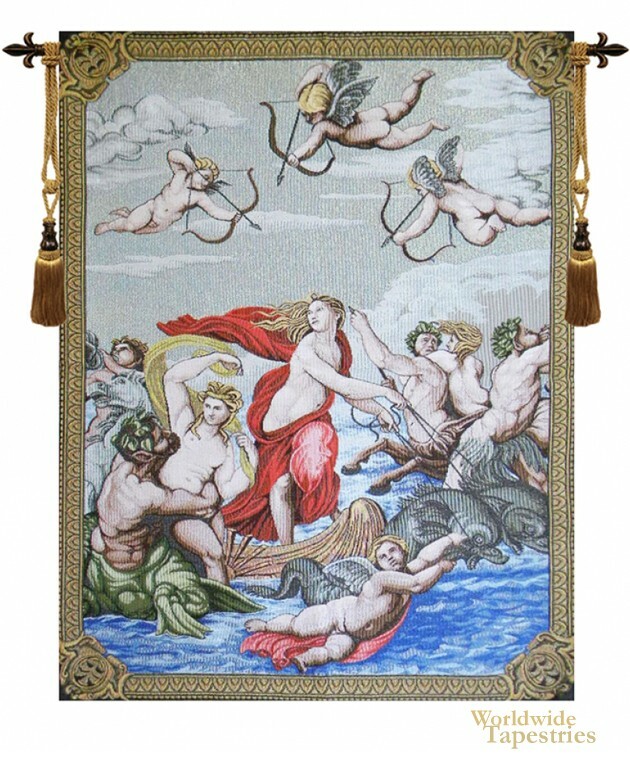 Galathea - Sanzio wall tapestry is based on the Triumph of Galatea fresco by Raffeall Sanzio from 1514. In this piece originally created for the Villa Farnesia in Rome, we see the nymph surrounded by sea creatures. To the left of the image Triton a merman, abducts one of the sea nymphs, while the Triton on the right is calling with a shell as a trumpet instrument. Galatea herself is on a shell used a a ship on the ocean, drawn along by 2 dolphins. Cherubs are seen on the sky with the arrows, as a trio of cupids pointing them at Galatea. This piece is seen as an apotheosis or a raising of a being to divine level by art, as an art genre. This Renaissance tapestry Galathea is backed with a lining and a tunnel for easy hanging. Note: tapestry rods and tassels, where pictured, are not included in the price.